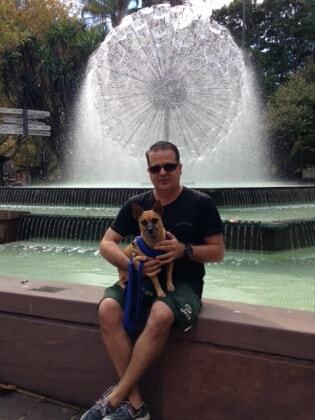 Review from Louis Nowra: I'd like to recommend Christopher Newman as a pet sitter worthy of five stars. He looked after Basil and Coco, our two small dogs, for a week. Coco is no problem at all, except for wanting all the attention she can get, but Basil was bought off a drug-dealer who tortured him and he will not relate to anyone except my wife, me and Coco. So it was a wonderful surprise to discover that when we returned from our holiday Basil adored Christopher and would lick and liked to be cuddled by him ( a first!). When we run into Christopher Basil immediately shows true affection towards him. No other person outside Basil's immediate family gets that reaction. My wife, Mandy and I have had others look after our dogs but Christopher has proved the best. Dogs adore him. Hi. I am a 45 year old male visual artist and graphic designer. I work from my home. I absolutely love pets and can give extra special 24 hour care, love and attention to your pet or pets. I live in a large apartment with a secure balcony (and Crimsafe security screens on all doors) overlooking the tennis and basketball courts in the Woolloomooloo playground area. Around and also near to me are lots of green areas and parks. I love to walk dogs. I also like to take them on activities. If you would like me to I can take your pet or pets on exciting extracurricular excursions (i.e. to cafes, to my local pub The Old Fitzroy, to art galleries, art openings, pet art-making classes and art appreciation walks, classes and lessons (see pics/ examples), special events for pets). Very near to me in my 2011 district are really lovely doggie leash-free fun-parks- Embarkation Park, Lawrence Hargraves Reserve, Beare Park, Macleay Reserve, Rushcutters Bay Park, Cook + Phillip Park etc) or if you prefer I can just simply enjoy time with your pet or pets in my casa, and take your pet on my near home walks and leisurely strolls in gardens. I have lots of experience (i.e. Louis Nowra and Mandy Sayers' Chihuahua’s Coco and Basil (you will see above a review on the top of my profile and also a picture of me and Coco and Basil on my lap at The Old Fitzroy Hotel enjoying ourselves. Coco and Basil love going to The Old Fitzroy Hotel in Woolloomooloo, it is part of their routine, I am also a good mate of Yoo-hoo, Ayeshas' dog at The Old Fitzroy). I also have experience looking after large dogs, (including of course family dogs). Plenty of experience with Labradors and Golden Retrievers. I also love cats too and I have minded cats in the past also, one time I sat and cared for 5 Burmese cats for 2 weeks in their owners home). For all bookings, it is absolutely imperative that I meet you and your pet/s (free of charge), either at my casa if pet/s staying at mine or at yours if I am minding your pet/s there. There will be an interview/ chat, (but also, importantly of course, to discuss your pet/s needs, likes/dislikes, requirements and/or any idiosyncrasies I should know about. I will be taking notes). I am very adaptable, (meaning that, if your pet is allowed to sit on my lounge/s, if that is the norm in your casa, or to be in a pet bed near to me). I will not accept aggressive, badly trained pets or pets that I feel would be unhappy to settle in with me as a temporary carer. Dog needs to be socialised. You will need to provide your prefered food for the term of your dog's stay and I will usually only take 1 dog or (2-3 dogs from the same family) at a time. I will of course though, offer my services if the meet and greet is successful and if I feel that your pet/s will have a lovely time. I'm confident they will tho. me caring for your pet! Chris was very accommodating, agreeing to take Kenton for a week at the last minute due to an emergency overseas trip. Kenton enjoyed his time with Chris and was lucky to spend time at his favourite parks and pubs in the area! Chris kept us regularly updated with photos of Kenton which was much appreciated. We could not be happier with our decision to leave Zoe with Chris while we went abroad for a 3 week holiday. He was so wonderful about sending regular updates and pictures, we never had to worry for a second about our sweet baby girl. Zoe came back to us clean, healthy, and happy...and from all the pictures, it looks like she might have had even more fun than we did! Chris is THE BEST and took such great care of our (super spoiled) puppy. We highly recommend him for so many reasons and will absolutely call on him in the future. I am skilled in pet care, walks and training. I provide activities, games and adventures for pets and a stimulating and learning experience in my company. I am skilled in any possible emergency and fast to act if any vet care is required. I am ever attentive of dangerous situations, pet fighting, cars, ticks, fleas, water, loud noises such as fireworks, pet jealousies and behavioural issues. I can administer oral medications to pets. I am loving, caring and a fun pet companion. I am trustworthy, honest and reliable.